It is generally accepted that the telecoms industry is currently undergoing a major process of transformation. In very general terms, telcos are engaged in a transition from being primarily operators of physical infrastructure and networks designed for the efficient delivery of analogue voice and packet data services, to being providers of cloud-based (distributed software, IT and virtualised) infrastructure, platforms and digital services (including communications). STL Partners has documented this sea change in numerous previous reports focusing on different aspects of the transformation: technology, processes, business models, organisation and culture. This report focuses more closely on two interrelated aspects: skills and culture. 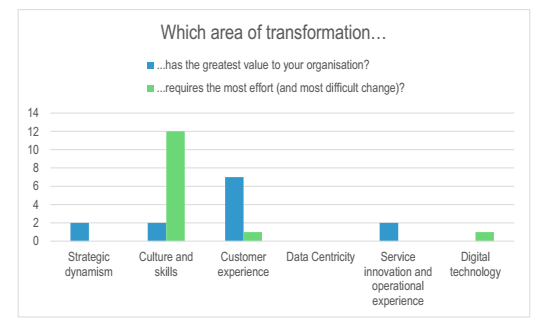 The above chart, reporting the results of a snap survey of attendees of the SE Asia summit, could be interpreted as implying that skills and culture change are of very little direct benefit to telcos, given that only two respondents indicated that it had “the greatest value” to their organisation. But at the same time, telcos are clearly focused on addressing the skills and culture issue, as this was overwhelmingly the most salient transformation challenge that the senior operator executives picked out. And the results of this small but high-quality survey are entirely consistent with STL Partners’ findings in other parts of the world, including research conducted for this report (see Sections 2 and 3 below). Precisely why have skills and culture emerged as such a critical challenge at this time? The skills issue is easier to analyse. The new business and technology model to which operators are transforming places a much greater emphasis on software and IT skills than traditional telco operations: skills such as software development and coding; digital product development and operations (DevOps), and marketing; cloud and IT infrastructure deployment, maintenance and support; etc. There is a chronic shortage of highly-skilled people in these areas, which varies country by country but could rightly be described as a global shortage owing to the international character of the telecoms industry. It is the top talent that is needed right now given the complexity of the technological and IT challenges that are involved in the migration from the legacy Telco 1.0 to the telco-cloud service provider (Telco 2.0).